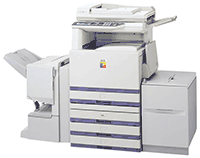 Magnum offers new and used printers, copiers, scanners and fax machines. The advantage of having Magnum source products for you is that Magnum will choose only the machines that we know are dependable and have a track record of solid performance. Devices can be purchased outright or leased. The advantage of a new device is that it usually comes with a year-long warranty. For newly released devices, the disadvantage is that if it breaks down within the first year, repair parts can often be backordered. Another disadvantage is that remanufactured supplies are usually not available until six months after it is released, leaving you paying a much high price for supplies. The advantage is that a refurbished device can be purchased for hundreds to thousands of dollars less than new. Magnum offers a 90 day parts and labor warranty on all refurbished devices.